Happy Be Kind To Lawyers Day! The attorneys with Althauser Rayan Abbarno are proud to celebrate #BeKindToLawyersDay and encourage you to consider the contributions of lawyers around the country and in your neighborhood. Lawyers around the world get a lot of grief just for being lawyers. Yet, when people need help planning their estate, forming a business, getting fair compensation after getting injured in a car accident or on the job, or defending their honor after being accused of a crime . . . to whom do they turn? The lawyers at Althauser Rayan Abbarno, LLP! Did you know that Althauser Rayan Abbarno, LLP delivered over $100,000 worth of financial support and free legal services to our community in 2018? The attorneys and staff of Althauser Rayan Abbarno, LLP are once again supporting the Miss Lewis County Scholarship program! Miss Lewis County 2017 Kennedy Woods and the 2018 Contestants for the Miss Lewis County Scholarship Program are hard at work preparing for the pageant on Saturday, March 10th. 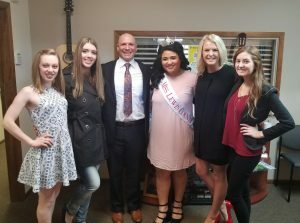 The Miss Lewis County Scholarship Program was not only supported by the law firm of Althauser Rayan Abbarno, but by Peter Abbarno who served as a mock judge for the contestants for the month prior to the competition. 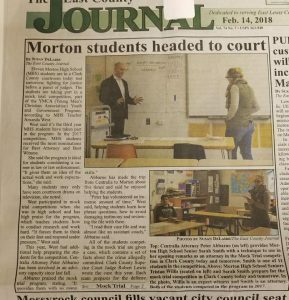 Peter Abbarno helps Morton High School Mock Trial Team! 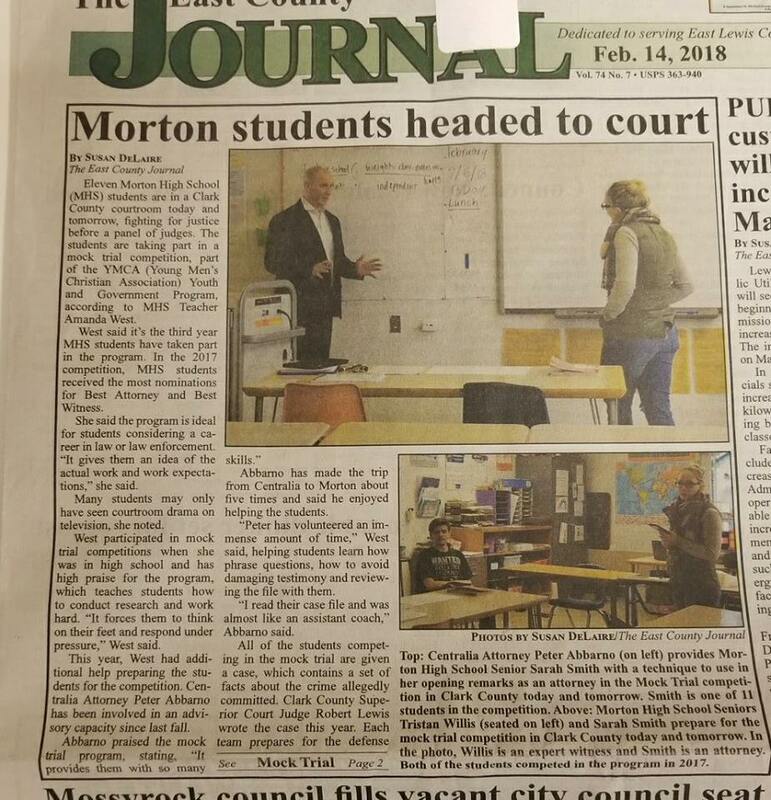 Althauser Rayan Abbarno partner Peter Abbarno has been volunteering his time to help Morton High School Teacher Amanda West prepare for the upcoming YMCA Mock Trials in Vancouver, WA. The Washington State YMCA Mock Trial Competition provides an opportunity for students to participate in a competitive high drama courtroom showdown between teams from around the state. The mock trial allows students to participate in a true-to-life courtroom drama. High school teams of attorneys and witnesses prepare the case for trial and compete at district levels before real judges in actual courtrooms. “Juries” of attorneys rate the teams for their presentation, while the presiding judges rule on the motions, objections, and ultimately the merits. From all the attorneys and staff with Althauser Rayan Abbarno, Congratulations and Good Luck!! Peter Abbarno, partner with Althauser Rayan Abbarno, LLP, will be braving the cold Puget Sound waters on February 10, 2018 as part of the Tacoma Polar Plunge to raise money and awareness for Special Olympics Washington and Lewis County Special Olympics. Peter is raising money and awareness for the Special Olympics athletes in our community. Law Firm Building Local Relationships For More Than 70 Years! Look no further than the law firm of Althauser Rayan Abbarno when you think about local businesses with deep community roots and a history of involvement and public service. Since 1946, Althauser Rayan Abbarno, LLP has served our community and provided exceptional legal services. With offices in Olympia and in the heart of downtown Centralia, Althauser Rayan Abbarno is a full service law firm that seeks long-term relationships with its clients. 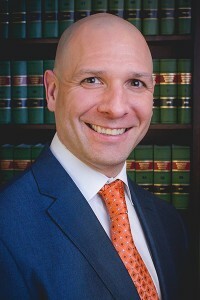 While partners Todd Rayan and Peter Abbarno focus their practices on personal injury, wrongful death and workers compensation, their team of six attorneys and nine staff help the community in many areas of law, such as estate planning and probate, family law, criminal defense, real estate and property law, and corporate and business formation. “Althauser Rayan Abbarno is proud to have a history of attorneys that were not only great lawyers, but cared about our community,” says Todd Rayan, partner since 2006. “Two recent partners, Ralph Olson and Chuck Althauser, were a credit to the legal profession and our community through their involvement with groups like Rotary, Centralia Dollars for Scholars, and the Providence Centralia Community Foundation.” Recent Althauser Rayan Abbarno partners have also donned the black robe with James Lawler serving as a Superior Court Judge and Wade Samuelson serving as a District Court Judge. 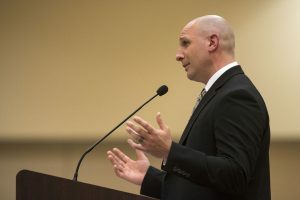 A partner in the firm since 2010, Peter Abbarno is dedicated to the people of Lewis County and was elected to the Centralia City Council in 2015. Abbarno is also vice-chairman of the Centralia College Foundation, a board member of the Boys and Girls Club of Chehalis, and hosts the weekday morning talk show “Let’s Talk About It” on KELA. Read more in the Chronicle Article featuring Althauser Rayan Abbarno. Newest Associate Allyson Felt handles all your Estate Planning needs. Althauser Rayan Abbarno recently added Allyson Felt to their all-star team as their law firm continues to grow. Allyson’s practice will focus on estate planning, probate, contract and property disputes, and civil litigation. Allyson is bringing a lot of experience to our community and Althauser Rayan Abbarno’s estate planning practice. Allyson concurrently earned Bachelor of Arts degrees in Broadcast Journalism and News Editorial from the University of Nebraska-Lincoln in 2010. From there, she relocated to the State of Oklahoma where she attended the University of Oklahoma College of Law. 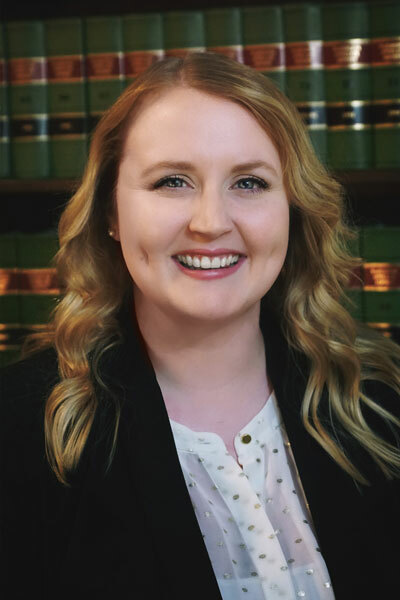 Prior to joining Althauser Rayan Abbarno, Allyson worked as an associate in-house counsel at a title insurance company located in Omaha, Nebraska. No one wants to think about death, but it’s as sure as taxes. So taking care of your loved ones and not leaving them serious financial burdens is important. It is your responsibility to make known how you would like your estate distributed. Althauser Rayan Abbarno has an easy process to get your affairs in order quickly. “Come in, meet with an attorney and we will set up the documentation you need, and that way you can be sure that in the worst-case scenario, if you are no longer there for you family, you have still provided for them,” Allyson explains. For more information about estate planning or the law firm, visit Althauser Rayan Abbarno’s website or call their offices at 360-736-1301 (Centralia) and 360-352-1134 (Olympia). Althauser Rayan Abbarno nominated “Best Place to Work” in Lewis County! 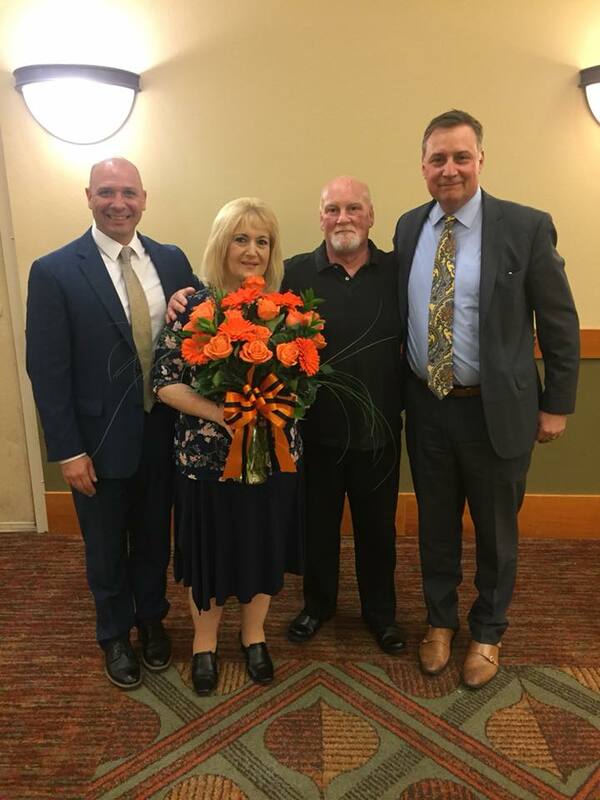 The law firm of Althauser Rayan Abbarno is honored to have been nominated “best place to work” in Lewis County for the second year in a row. The attorneys and staff pride themselves on being advocates for their clients and providing a high level of customer service and communication. 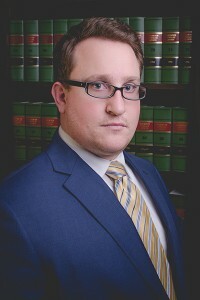 Althauser Rayan Abbarno has offices in Centralia and Olympia and serve clients throughout the State of Washington in areas of Personal Injury/Automobile Collisions; Workplace Injuries/Workers Compensation, Criminal Defense, Family Law, Estate Planning, Contract/Property Disputes, and Corporate/Business formation. Associate Jake McGhie was nominated “Best Young Professional” in Lewis County! The nominees were chosen by the Chronicle Newspaper readers and the final vote is June 19th through July 2nd. Althauser Rayan Abbarno attorney Peter Abbarno delivers keynote address at Chamber Scholarship Luncheon. The top 25 graduating students from both Centralia and Chehalis were honored by the business community and received scholarships Monday at the annual Rob Fuller Luncheon hosted by the Centralia-Chehalis Chamber of Commerce. The seniors spoke briefly on plans to attend colleges, trade schools or join the military to become everything from teachers and nurses to accountants and underwater welders during the event at the Great Wolf Lodge. At this point, one chapter is closing and another one is beginning for the students, he said. To read more, visit the Chronicle article. Althauser Rayan Abbarno sponsors “Say Anything” movie at Fox Theatre! 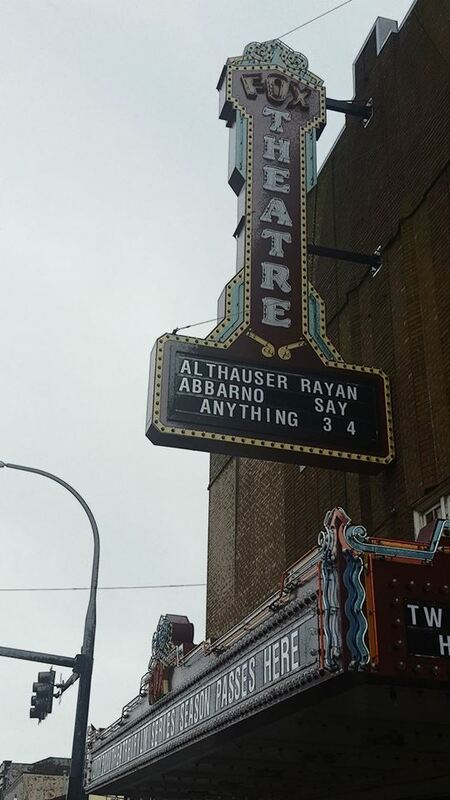 The law office of Althauser Rayan Abbarno, LLP is a proud sponsor of the Historic Centralia Fox Theatre, the restoration of the Fox, comedy, romance, 80’s movies, John Cusack (who isn’t) and a good time! Please join us on March 4, 2017 at the historic Fox Theatre for the showing of Say Anything with John Cusack. Showtimes are 2pm and 7pm!